Why do I need a steering damper? If you need too much energy to hold the steering whilst you are riding. A steering damper is used to support the rider. This is something that depends on personal feeling. Most of the times a steering damper is used for Super Sport bikes on roads or on track. However, also on many Naked Bikes you will find an original mounted steering damper from the manufacturer. 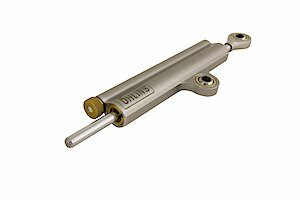 Beneath you will find an overview about the ÖHLINS steering damper.